I feel like I’m watching the opening scene from a movie. Projected across one of the world’s longest video screens – a 108-metre monster that looms over the track at Meydan Racecourse – is the image of Dubai ruler Sheikh Mohammed bin Rashid al Maktoum. 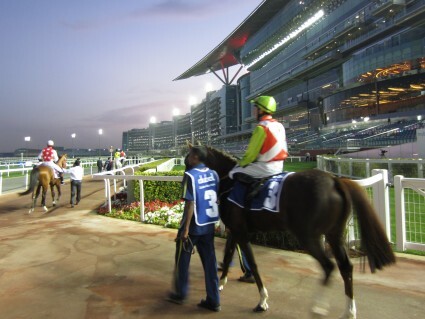 He’s strolling nonchalantly towards the winners’ enclosure, surrounded by friends and family, all immaculately dressed in traditional Arabian kanduras. This is no public relations stunt. The sheikh is a horse-racing fanatic who regularly makes an appearance at Meydan to watch one of his vast stable of thoroughbreds. This entry was posted in Uncategorized by Rob McFarland. Bookmark the permalink.